In this step, we explore some of the more advanced features of Visual Studio code, such as how to use the integrated terminal and our newly installed Salesforce Extension Pack. Like with any good development tool, there is more than one way to do things with Visual Studio Code. The two main ways you can interact with Salesforce CLI are through the integrated terminal or quick open window. To view the quick open window, press Command + P on Mac or Ctrl + P on Windows. If you type ? you can view the help menu. Through this module we will use the quick open window in command palette mode, which allows us to show and run commands. Through the rest of the project, we rely on both the terminal and the quick open window. In order to best prepare you and show you the differences, we show you how to create a project in both ways. You only have to create the project once. Press Command + Shift + P on Mac or Ctrl + Shift + P on Windows to make the command palette appear. This should autocomplete when you type any part of the command name. If it isn’t working, make sure the prompt starts with > and that you have the Salesforce Extension Pack and Salesforce CLI installed as described in the previous step of this quick start. Select your Desktop as the place to create the project in so it is easy to find later on. Wait for the new Visual Studio Code window to open. You should see an indication that the extension is preparing your project before populating the file explorer. Click Terminal on the top options bar. From the dropdown select New Terminal. It takes a moment for the terminal to return your results. The command creates four files, sfdx-project.json, README.md, .forceignore, and project-scratch-def.json. Also, if it’s your first time using Salesforce CLI and Extension Pack, you see a notice that the extension pack may collect usage data. We use this data to help make the product better by collecting bugs and other metrics. In Visual Studio Code, press Command + O on Mac, or Ctrl + O on Windows. 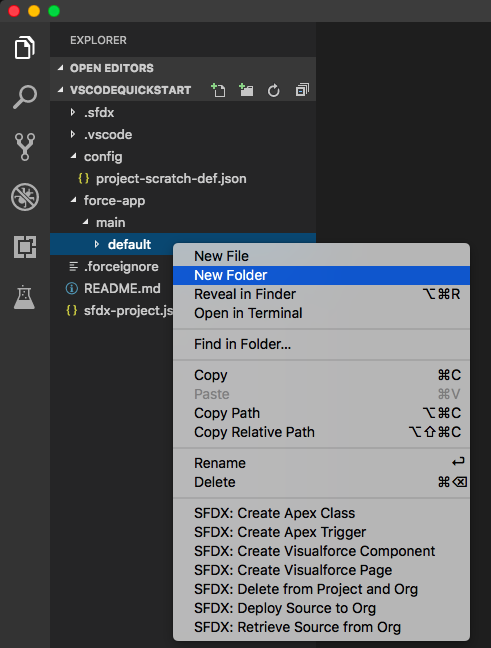 Choose the newly created VSCodeQuickStart folder. Press Command + P on Mac or Ctrl + P on Windows to make the search palette appear. This shifts the focus to search files. Type project-scratch-def.json into the field. Click the result to open the file. On the left hand side of Visual Studio code, click the magnifying glass . This is the Find and Replace menu. Click the first time it is found in project-scratch-def.json. Change the orgName value (after the : and in between the “”) to Learning VS Code. Save the file by pressing Command + S on Mac, Control + S on Windows. Type SFDX: Authorize an Org. To accept the default login URL, press Enter. 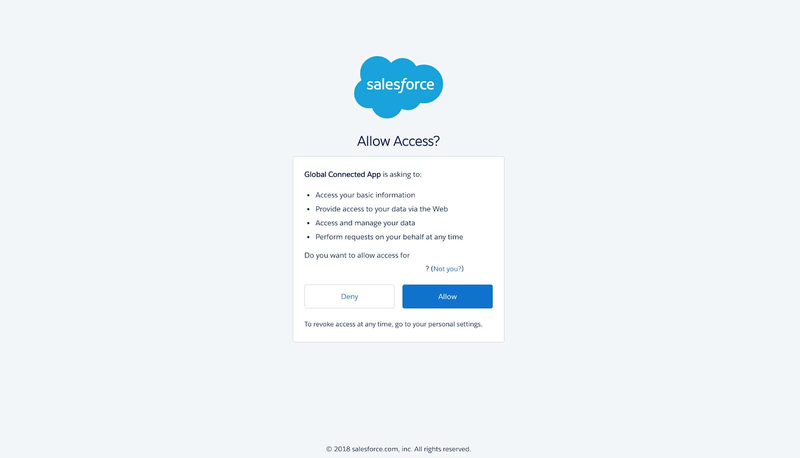 Notice that your default browser opens a new Salesforce login window. Log in to your playground using your playground username and password retrieved from the last step. When you are asked to grant access to the connected app, click to allow. Check it out, your successful integration was logged in the output panel! 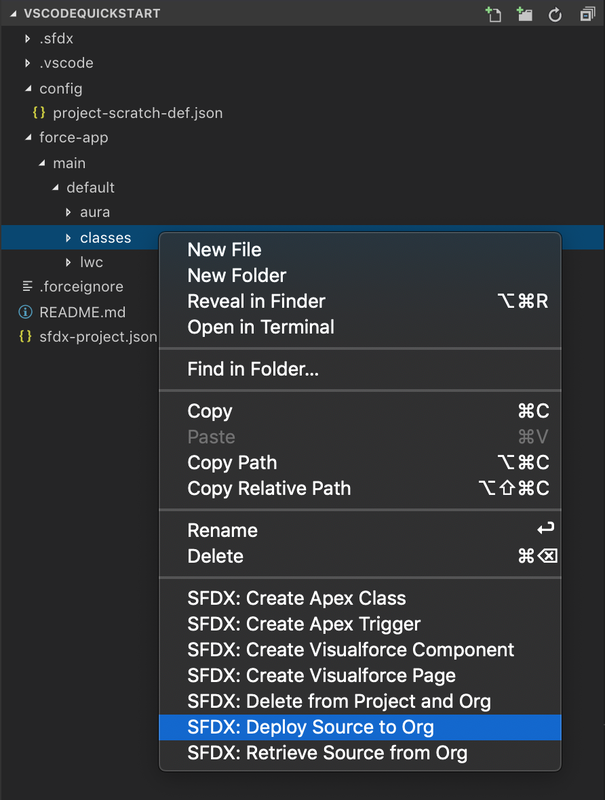 Click the Explorer icon in Visual Studio Code to expand the force-app folder. 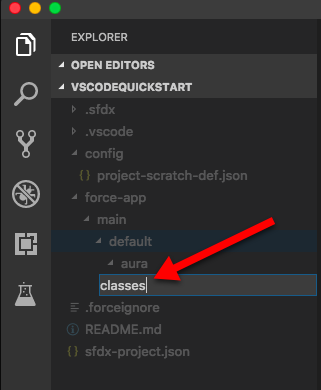 Under the VSCODEQUICKSTART directory, click force-app to show its folder tree. You should see main, then default, then aura and lwc. Right click the default folder. Name the new folder classes. Type SFDX: Create Apex Class. If VS Code asks, select force-app/main/default/classes as the directory you wish to add AccountController.cls to. Our new Apex class has a SOQL query in it, but we want to make sure it works as we expect before we deploy it to our org. We use the command palette to run the query against our org. Search for SFDX:Execute SOQL Query with Currently Selected Text. Select REST API and press Enter. Similar to the other actions you’ve invoked through the extensions pack, it takes a moment for VS Code to return the results. In the Output tab of the integrated terminal, view the results of your query. You should have also received a notice that states: SFDX: Execute SOQL Query ... ended with exit code 0. This means it successfully ran. The last step is to deploy your code to your playground from within Visual Studio Code. Right click the classes folder. In the Output tab of the integrated terminal, view the results of your deployment. You should have also received a notice that states: SFDX: Deploy Source to Org ... ended with exit code 0. This means it successfully ran. You’ve learned how to use Visual Studio Code and the Salesforce Extensions. You’ve seen how the features of an IDE can help maximize your development efficiency. Now you’re ready to explore some of the more complex topics, such as debugging with the Apex Replay Debugger, customizing your editor to fit your needs, and running your developer pipelines with Visual Studio Code.